The Irish are so adept at knocking out great plays that Australia’s main stages can’t hope to keep up. 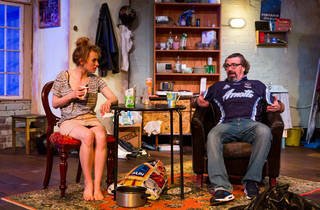 Luckily, there’s the likes of O’Punksky’s Theatre, the company started by Maeliosa Stafford, Patrick Dickson and John O’Hare, to pick up pots of gold left by the wayside, such as Conor McPherson’s 2013 award winner The Night Alive, getting its Australian premiere at the Old FItz. 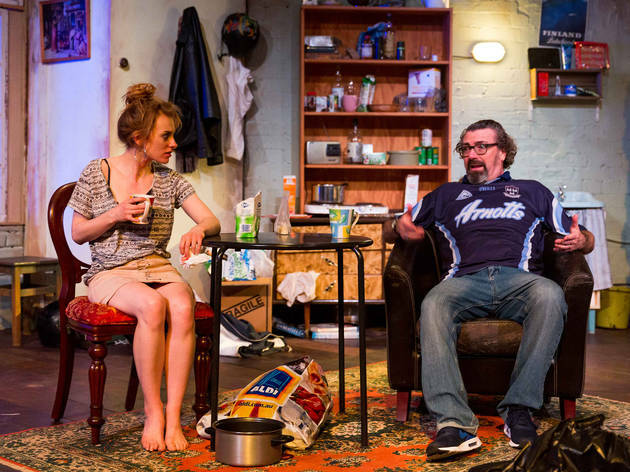 This production, directed by Stafford, is yet another example of the world class theatre that’s going on in the bowels of the humble Old Fitzroy pub. Ireland-born Stafford, who has done more to bring great Irish theatre to Australia than anyone in living memory, takes audiences on an captivating journey into the lives of five Dubliners doing it tough. The scene is the abode of Tommy (O’Hare), a fortysomething estranged from his wife and kids who is renting a couple of scungy rooms from his disapproving Uncle Maurice (Dickson). Tommy enters with Aimee (Sarah Jane Kelly), a younger woman who is clutching Tommy’s jacket to her bloodied nose. Aimee is in fear for her life, and the good samaritan Tommy offers her shelter, even though the camp bed is usually taken by Doc (Laurence Coy), his lovably dim-witted employee in odd jobs and borderline criminal business. All four characters have taken hard knocks and want different things from the others. Doc would like to be paid by Tommy in something other than out-of-date cigars. Maurice would like Tommy to come to his late wife’s memorial service and stop being such a deadbeat. Tommy would like to forge a connection with Aimee, and Aimee is more concerned about staying away from Kenneth (Darren Sabadina), a man whose personal issues veer towards mania. McPherson (The Weir, The Seafarer) crafts naturalistic plays that get under the audience’s skin the old fashioned way: by letting you live with the characters for a while and come to care for them. Sudden violence helps push the plot along and blackly comedic dialogue greases the wheels, but The Night Alive is ultimately a bittersweet portrayal of lost souls looking for a way out. Its two hours go by in a flash. Incredible play, stunning cast, tight production, LOLs and tears aplenty, what more can we ask for!